Georgia Clinical & Translational Science Alliance | Poster Spotlight: When do we Order CT to Assess Abdominal & Pelvic Pain? 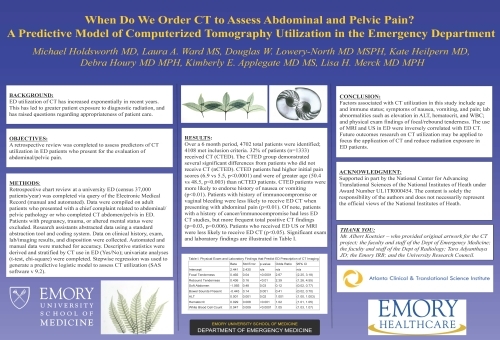 Poster Spotlight: When do we Order CT to Assess Abdominal & Pelvic Pain? Dr. Merck is an Assistant Professor in the Departments of Emergency Medicine and Diagnostic Imaging at the Alpert Medical School of Brown University, an attending physician at the Rhode Island and The Miriam Hospitals and Co-investigator of the ProTECT III Clinical Trial at Emory University. She has a public health background in epidemiology, disease prevention and advocacy for pediatric high-risk populations. Dr. Merck's current research in Emergency Medicine focuses on the treatment and prevention of neurological emergencies in adult and pediatric populations. Dr. Merck is also studying ways to reduce iatrogenic exposure to ionizing radiation from diagnostic testing in the Emergency Department. Dr. Houry is Vice-Chair for Research and Associate Professor in the Department of Emergency Medicine at Emory University School of Medicine and in the Department of Behavioral Science and Health Education and Department of Environmental Health at the Rollins School of Public Health. She is the Director of the Emory Center for Injury Control and PI on the CDC Injury Control Research Center grant (1 of 11 nationally). Dr. Houry is also the chair of the Emory University Senate Committee on Safety. Dr. Houry has authored more than 70 peer-reviewed publications and book chapters on injury prevention and violence. She has been the recipient of several national awards, including the Jay Drotman Award, given annually by the American Public Health Association for the most outstanding young public health professional in the country and the first Linda Saltzman Memorial Intimate Partner Violence Researcher Award from the Institute on Violence, Abuse and Trauma. She serves as Treasurer for the Society for Advancement of Violence and Injury Research and is the President of the Society for Academic Emergency Medicine.